IMAT Solutions announced today that Community Care of North Carolina, Inc. (CCNC, Inc.) has implemented the IMAT Enterprise Data Foundation to support its fourteen regional networks and 1,820 participating primary care practices. CCNC uses IMAT Enterprise Data Foundation to improve its data in five key areas: availability, conversion, quality, normalization, and output. Data Availability: Prior to implementing IMAT, CCNC required data senders to provide data in an HL7 format as that was the only format their systems could accept. Now CCNC can accept almost any file format ranging from CSV to CCD and CCDA. Additionally, IMAT’s completeness reports and real-time searches allow CCNC to quickly ascertain how many records it has and what fields those records contain. By providing CCNC with information about its data and rapid access to all of the records, IMAT enables CCNC to leverage its data in new ways, such as calculating the cardiovascular risk scores utilized under the Stroke Prevention Grant. Data Conversion: CCNC used to receive data in the HL7 and convert this data into XML for loading into its database. Now CCNC uses IMAT to ingest virtually any health record type and convert the data to any other standard format. Conversion time has been reduced from four to five hours per batch to under 30 minutes per batch. Data Quality: CCNC formerly ran a quality assurance process on each batch of data. IMAT allows CCNC to automate that process and reduce the time required for quality assurance checks from three to four hours per batch to under an hour for aggregated data. Data Normalization: IMAT allows for the input of clinical data from diverse EMR’s and normalizes the data to provide consistent, standardized quality dashboards for primary care practices across the state. Rather than spend two to three days running Vlookups and creating mappings for every variation in spacing, misspelling, and extraneous characters, IMAT Enterprise Data Foundation’s record processing system allows CCNC to handle the same task in under four hours even while adding unit conversions, calculated values, code set look ups, and other data enrichment steps. Data Output: Running output scripts can take four to five hours to run and entire batches are often interrupted because of an issue with a single record. IMAT converts CCNC’s batches of data to any standard output format in under 30 minutes and individual records can be accepted or rejected without delaying the batch. By including data from all of CCNC’s systems, standardizing it, and making it available in interoperable formats, IMAT will help CCNC reduce errors and increase efficiency. The use of IMAT also provides CCNC with a much higher confidence in the quality of the data they have supporting their extensive analytics capabilities. About Community Care of North Carolina, Inc.
IMAT Solutions was formed in 2013 to provide key innovations in data accessibility, analysis, and reporting to healthcare organizations. 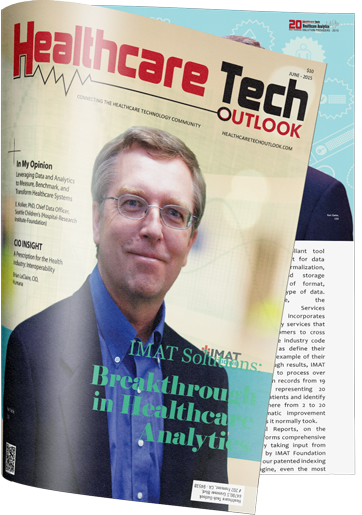 IMAT helps improve care, increase efficiency, and decrease cost. IMAT’s modules make it a flexible solution that can be tailored to each organization’s needs.